3X rinse in 25mM NaCl, 1mM CaCl2, 0.15M cacodylate buffer, pH 7.2. Microwave 1 min, then hold samples 10 min at rt. 1% OsO4, 0.5% KFe(CN)6 in 1mM CaCl2, 0.1M cacodylate buffer, pH 7.2. Microwave 2X (10 min ON, 3 min OFF) then hold 15 min at rt. Temperature may range from 15-35°C during irradiation. 3X rinse in 0.15M Na Acetate buffer, pH 5.2. Microwave 1 min, then hold 7 min at rt. This step adjusts pH prior to uranium acetate (UAc) staining. 0.5% UAc in 0.15M Na Acetate buffer, pH 5.2. Microwave 2X (5 min ON, 3 min OFF) then hold 15 min at rt. Temp may range from 10-33°C during irradiation. 3X rinse in 0.15M Na Acetate buffer, pH 5.2. Microwave 1 min, then hold 7 min at rt. 3X rinse in 0.15M cacodylate buffer. Microwave 1 min, then hold 7 min at rt. Embed samples in parallel in 3% Type VII agarose, then hold overnight at 4°C. Dehydration schedule is done at rt, 50% ethanol, 10 min; 70% ethanol 10 min; 80% ethanol, 10 min; 90% ethanol, 10 min; 3X 100% ethanol, 10 min each; 3X 100% propylene oxide (PO), 10 min each. Infiltration schedule is done at rt on slow rotator, 2 parts PO to 1 part resin, 2 h; 1 part PO to 1 part resin, 2 h; 4 changes in 100% resin over one day. Arrange samples in flat embedding mold and cure at 60°C for 65 h.
Most earlier methods for fixation and embedding of C. elegans require one to cut open the eggshell (by laser) or cuticle (by razor blade) to allow free access of fluids to the inside tissues. When those cuts are not made, the animal may continue to live in the fixative indefinitely, as well as fail to become properly dehydrated or infiltrated with plastic resin in later steps in the protocol. Use of a scientific microwave oven can supercede this requirement, allowing one to fix many animals simultaneously without any cutting. How the microwave energy helps solutions to cross the barriers (eggshell or cuticle) is a matter for conjecture (Login and Dvorak, 1988). Our laboratory has devised several useful protocols for preparing large quantities of nematodes with the use of microwave energy. These methods have been particularly useful for immunoEM studies (Hall et al., 1999; Paupard et al., 2001), but can also be adapted for studies of the ultrastructure (Ciche et al., 2008; Jones et al., 1994; Wergin, 2000). Ultrastructural results are not always equivalent to those obtained by cutting the animal open with a blade, but do provide less hazardous working conditions for experiments on parasitic nematodes. Microwave fixation also provides a less labor-intensive method to compare the anatomy of many individual animals in parallel. The microwave method does not involve ‘‘cooking’’ the specimen, and in fact one must avoid exposing the sample to high temperatures. Due to lack of control of energy levels and temperature, a typical kitchen microwave oven is not suitable for these experiments. Scientific microwave ovens provide sophisticated control of energy levels, timing of irradiation in short bursts, careful monitoring of sample temperature, and automated cooling of the sample during irradiation. Some protocols also place the hydrated samples under a vacuum to induce solutions to cross the cuticle barrier more freely. The same scientific oven can also be used for other steps in tissue embedding and for histochemical staining and antibody studies, including antigen retrieval (Giberson and Demaree, 2001; Login and Dvorak, 1988). In our earlier publications using the microwave method, we utilized an early model Pella oven and placed our sample at a ‘‘hotspot’’ in energy intensity (set to 350 W) while chilling the sample on ice (cf. Paupard et al., 2001). Since then we have switched to a microwave oven with better controls over sample cooling and the energy profile within the chamber of the oven (EMMicroFIG 1). We have substantially modified our protocols, moving to lower, more even energy levels across the chamber (50, 75, 90, or 120 W, etc. ), longer exposures to microwave energy, automated cooling via a ‘‘Coldspot’’device, and careful monitoring of sample temperature. Here we describe methods to use the modern ‘‘Biowave’’ oven (Ted Pella) for both ultrastructure and immunoEM procedures. EMMicroFIG 2 shows a representative example of microwave results for the structure. Samples can be held in shallow wells of a nine well Pyrex dish or in a multiwell plastic culture dish (Falcon 12-well dish, cat #351143) (EMMicroFIG 1B), with a temperature probe resting in one well to check the current state of the samples. It is also feasible to hold samples in Eppendorf tubes, immersed in a shallow well of coolant resting over the Coldspot plate. A ‘‘restriction temperature’’ is set at 39°C, such that microwave energy shuts off any time the probe temperature approaches 39°C, resuming only when the sample cools below the restriction temperature. The Biowave oven can be tuned to very low power (for instance, 70 W) and the Pelco Coldspot device inside the oven chamber minimizes sample heating during extended irradiation. Using such low levels of radiation and the Coldspot device, the restriction temperature is rarely achieved even while maintaining irradiation for long periods. Multiple steps in processing are done in the chamber, using further irradiation to aid each rinse step or stain. It is easy to use this procedure to treat 100 animals or more under uniform conditions in each well. Several different ages or alleles can be treated in different wells, in parallel, with much less labor than any cutting method. Use of the microwave energy also helps to shorten many of the steps, so that a full protocol may occupy half a day rather than 2 days. 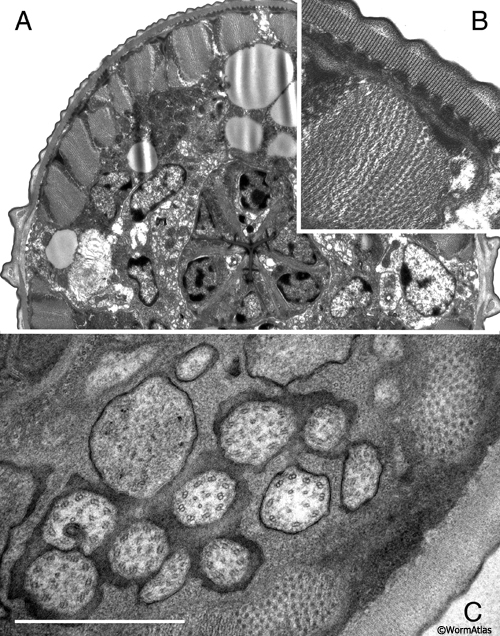 EMMicroFIG 2 shows an example for the ultrastructure of a Heterorhabditis infective larva (Ciche et al., 2008) and a C. elegans wild-type dauer. Scientific microwave ovens are available from Pella or EMS. By dialing down the power setting to 70 W or lower, the samples may stay cool without ever hitting the restriction temperature. If one desires to try a higher energy, say 120 W, start the experiment by filling the Coldspot device with ice water (or chilling the Coldspot device in an ice bucket or in a cold room for 1 h). By setting the starting temperature even lower, one may still be able to irradiate continuously for a relatively long time without approaching the restriction temperature. One must include some paraformaldehyde in the first fixative. If only glutaraldehyde is used as a fixative, microwave energy will not be sufficient to force enough fixative across the nematode cuticle, and some animals may remain swimming even after 30 min under irradiation! One can expect only partial success in fixation and embedding compared to razor-cut methods. Some animals will show signs of poor fixation or poor embedding. Poorly embedded animals or embryos will often show local softness of the plastic and tearing of the thin sections at the edges of some specimens, leaving a hole in the section where the tissue should be (similar to the embedding defects seen in EMMicroFIG 3 for yeast). Poorly fixed embryos may appear excessively dark inside the intact eggshell, and adults or older larvae may be only diffusely stained when viewed by the TEM. Nonetheless, some samples will become well fixed and suitable for investigation. Shallow volumes of fixative allow better penetration of microwave energy than deeper volumes. Worms swimming at the bottom of a relatively deep well of fixative may be protected against fixation and swim for long times. To obtain faster killing, place worms in shallower volumes. The Coldspot plate can still serve as a suitable ‘‘water load’’ so that the small worm sample volume will not overheat. EMMicroFIG 1: Microwave oven layout. A. Front panel of Pelco Biowave microwave oven has all major controls. Arrow indicates the vent carrying any toxic gases to a fume hood. B. Inside view of oven chamber. Samples lie in I2 well culture dish on top of Coldspot plate. Arrow indicates temperature probe, whose tip lies in one of the sample wells to monitor sample temperature. EMMicroFIG 2: Microwave fixation for ultrastructure. A. Low-power view of a J1 larva of Heterorhabditis bacteriophora, whose thick cuticle makes it difficult to fix. Cross section through head, pharynx and nerve ring. This animal was prepared without cutting open the cuticle. 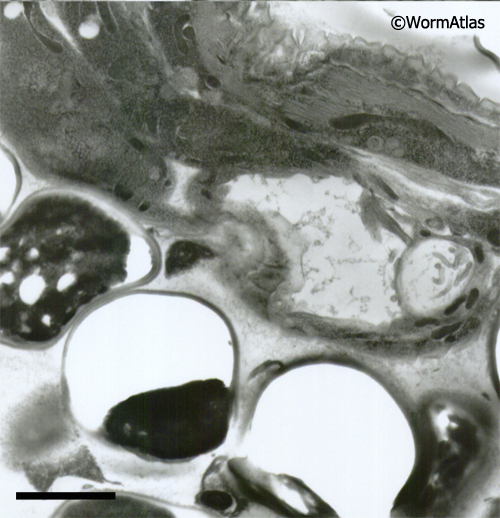 B. Inset shows body wall muscle and dauer-like cuticle structures of the Heterorhabditis J1 larva. C. C. elegans wild type dauer nose showing cilia of the amphid in cross-section. Prepared without cutting open the cuticle. Scale bar, 1µm. EMMicroFIG 3: Embedding artifacts. Low-power image showing nematode embedded lengthwise in yeast paste where individual yeast cells have failed to freeze or embed well, leaving either an empty hole or a shriveled wisp filling one side of the hole, thus weakening the plastic section. The worm also looks distorted. Scale bar 2µm.